What is life? Where did it come from? Why does it end? Everything in the universe, from the smallest microbe to the largest cluster of galaxies, is constructed from the same fundamental building blocks and is subject to the same laws of nature; what is true for a bacterium is true for a blue whale, notes particle physicist Brian Cox. 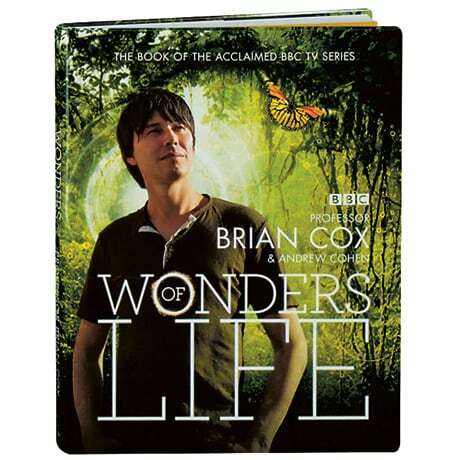 In this beautifully illustrated companion volume to the BBC television series of the same name, illustrated with spectacular color photos and drawings—many filling one or two pages—Cox explores the astonishing inventiveness of nature and various evolutionary milestones since the first spark of life in a refreshingly conversational approach. He takes us from the subterranean networks of freshwater caverns on the Yucatan peninsula to the unique life forms that have evolved on the island of Madagascar, along the way befriending such enchanting creatures as the gigantic, highly inquisitive robber crabs of Christmas Island and the octopus, whose eyes are as sophisticated as our own but reveal a different evolutionary approach.